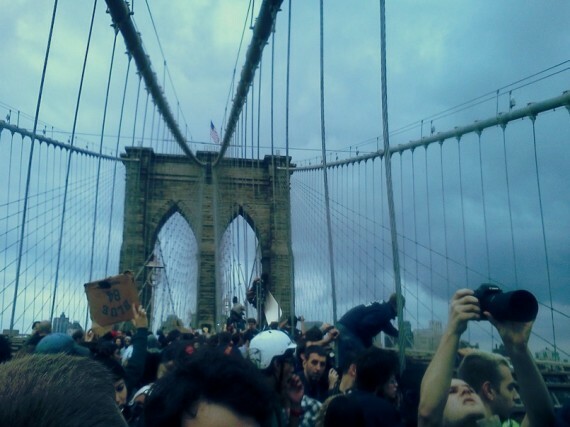 This past October my friend, Laura and I were arrested on the Brooklyn Bridge along with seven hundred other Occupy protestors. Laura, who I’ve known since middle school, happens to be a Muslim American. She wears beautiful headscarves that show her beliefs and upbringing. I stood in my jail cell with six older women, all of whom happened to be teachers. Laura walked along the row of cells with her Arresting Officer. My fellow jail mates cheered as she passed, just as they did for every other protestor. I was about to join in, but then my stomach dropped. My hand reached for my mouth and sharp tears burned my eyes. I’m used to seeing Laura in private without her headscarf, so it took me a moment to realize. They had stripped her of her headscarf, and with it, my apathy and sense of defeat. Outrage and humiliation rushed through me as she dragged her feet with her arms outstretched, her face in shock and her mouth and eyes wide. Her thick, glossy, dark Mediterranean hair was matted to her head from the long, laborious day on the bridge. It took my cellmates a few moments to recognize her without the clean, white satin framing her tan face and resting on her shoulders and upper back. My cellmate Mary, who had a four-year-old girl waiting for her at home, jumped up onto the bars: “Give her back her headscarf!!! !” I ripped off my hoodie and hopelessly flailed it in between the bars, but Laura was out of my bar-restricted vision. Officers walked by staring straight ahead; shrinking along the wall opposite our cells. Every male officer that headed in the direction of Laura’s cell made me I cringe and flail more desperately, trying to get the attention of a female. Among the chaos, I noticed a female officer on the edge of my periphery. I flung my hooded sweatshirt at her as best as I could with my restricted arm movement. “Give that to Laura!“ I ordered. “The girl who wears the headscarf—give it to her! !” She backed away, without saying anything. She left my line of vision, in the direction of my poor friend’s cell. I yelled a halfhearted “thank you,” but I wasn’t even sure if she would give it to her.